Sugar. Fat. Candy. Three words we have a knee-jerk reaction to when it comes to snacking. But you don’t have to be afraid of these three “no, nos” the next time you plan a snack for your children or yourself. Go with these snack options when you want a snack that isn’t boiled egg whites or kale. 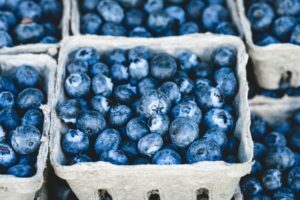 According to the U.S. Department of Agriculture (USDA), one cup of raw blueberries has 14.7 grams of sugar. With a growing culture of moving away from sugary snacks, don’t diss the berries. Fruits are great sources of sugar because of the nutrients they provide in addition to the glucose and fructose (the things that make up sugar). The New York Times well blog says watch out for dried fruits, though. Without the diluting water that is taken out during the drying process, sugar is more concentrated. They may be tiny, but sunflower seeds pack a lot of fat, over 63 grams according to the USDA. But its the fat that our bodies and the bodies of our little ones actually need. Sunflower seeds also have a good dosage of fiber, which is good for the gut. Do watch out for added salt in packaged seeds. Also, check the label to make sure your seeds aren’t packed in a facility where peanuts are handled, for those who have peanut allergies. To reduce exposure to our friends with allergies at Garner Road Community Center, we ask you to keep peanut snacks at home. Children and Chocolate are not always a bad combination. Dark chocolate has been all over the news for its heart benefits and its low sugar content. For those who are children at heart, dark chocolate may also be good for those microbes in the adult tummy, according to Scientific American. Be warned, kids may be use to the sugary taste of traditional chocolate and have reactions like these in this ad for Splendid Chocolate.